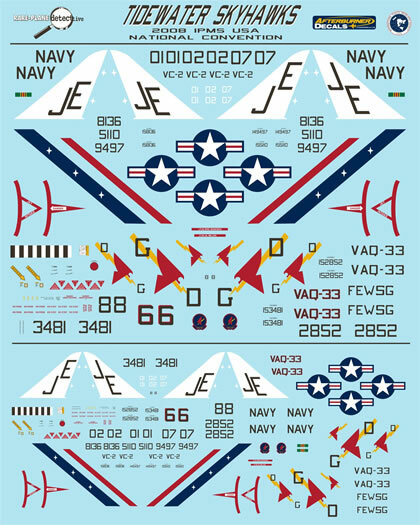 IPMS Tidewater, with the generous sponsorship of Rareplane Detective and Afterburner decals is proud to offer a limited edition decal sheet for sale at the 2008 IPMS-USA National Convention. 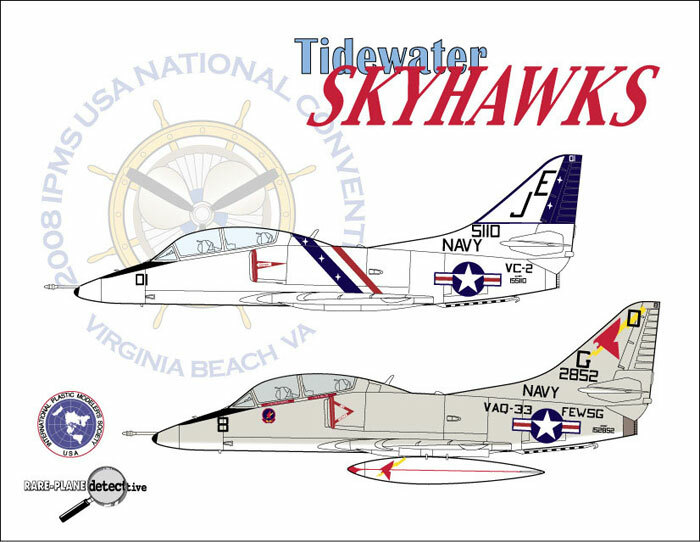 Celebrating two of the local squadrons that flew Skyhawks, this 8 x 10 sheet includes markings for VC-2 Skyhawks based at NAS Oceana and the Skyhawks of VAQ-33 at NAS Norfolk. 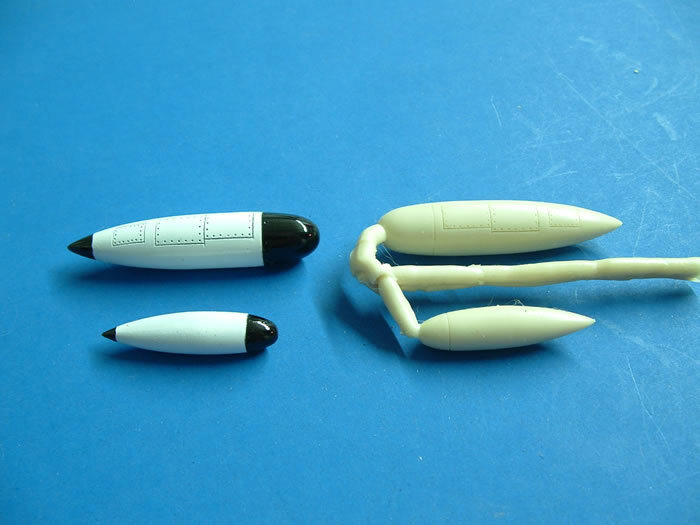 The sheet includes markings in both 1/72 and 1/48. VC-2 flew a variety of single seat and dual seat A-4s. 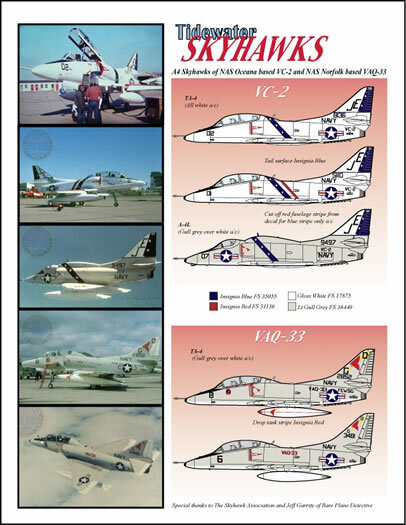 Aircraft covered in the sheet include an A-4L and two TA-4Js, one in 1976 Bicentennial markings. With additional bureau numbers and side number (not provided) almost any A-4C, A-4E, A-4L and TA-4J of VC-2 can be built. VAQ-33 had a mix of aircraft including two EA-4Fs. Markings are provided for both of these aircraft. The EA-4F was externally indistinguishable from the TA-4J, but had a more powerful engine. There were no guns on these aircraft. So the new Classic Airframes Navy Aggressor kit is perfect. The decal sheet will be offered at the convention at the low price of $10. In addition IPMS Tidewater will offer an Electronic Signal Simulation (ESS) pod carried on the Skyhawks of VC-2 and VAQ-33. The pods were mastered by Ben Guenther and molded by Dave Merriman. The pods are another convention special and will sell for - $3 for a pair in 1/72 and $4 for a pair in 1/48. Thanks to IPMS Tidewater for the information and images.